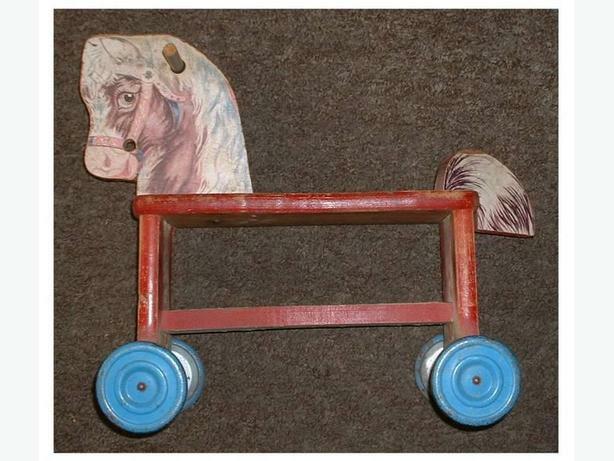 Children's horse manufactured by Gong, possibly 1920's. Body is of wooden construction, lithograph pattern mostly intact; one area on main board where it has been torn away, about one inch across. Wear of lithograph on top of seat. Wheels made from tin and ring when rotated; some moderate scratches and paint loss on wheels. Pick up or shipped only. Buyer pays shipping, cash preferred.